These notes only apply to pre-2009 BugE kits that have drum brakes. The new BugE kits now come with disk brakes. The speedometer kit came with a speed sensor, mounting bracket and several magnets. The instructions covered programming the unit rather well, but it did not cover the more mundane task of mounting the sensor! In the image to the right, the sensor is shown mounted in the bracket. 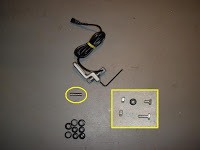 A hex wrench is used to secure a set screw for the sensor. The kit also came with some tiny rare earth magnets (circled). To mount the sensor, I used a 1/4-20x3/4" hex bolt and two washers left over from a Radio Shack grommet kit (Part# 64-3025). Earlier in the BugE steps, I used the smaller grommets from the package to protect the holes when I was filling the frame with anti-corrosion paint. Since I did not use all the larger sizes, I had quite a few left over. Inside the yellow square, a 1/4-20-3/4" hex bolt is shown cut to 3/8" long plus a washer can be seen. The other nut/bolt is shown so the original bolt length can be seen. The left most photo shows the speedometer arm balancing on the steering spindle pin. The bolt & nut are held in the mounting arm tight due to grommet#1 filling the space. The sides of the hex nut have been filed down slightly so it will fit tightly in the brake channel. Once the brake assembly is pushed back onto the steering spindle, all the parts are held together by pressure. Grommet #2 was added for a tighter fit. Once the bracket is in place, the sensor is mounted to the arm using a set screw. The next step was a bit messy for me. There is no place for the magnets on the BugE tires. I didn't want to weaken the wheel by drilling little mounting holes so I figured that the little magnets should be glued on. The product I used was J-B Weld. There are three reasons for this. First, the mounting material should be strong. Second, it should be resistant to water. Third, and most important for me at the moment was that it was cheap. Fortunately, I had a box full of glues, epoxies and calk collected over the years. So, I punctured the tubes, mixed the product and it worked. I was impressed. I'm pretty sure the "new" pack I used was at least 10 years old! Once the epoxy dries, I put the wheel back on. Then I used a Dremil tool to drill a square hole through the wall of the BugE large enough, and square enough for the sensor wire end to go through. Then, I took a small grommet & split using a razor blade so it can go around the cable. Then, I took a larger grommet & work it over the connector, then put the larger grommet over the smaller split grommet. Then, I stuffed both grommets into the square hole which will took up the space around the cable. Hopefully it will hold. I'll be watching that cord. If it wanders around too much in the wheel well, I may use some split tubing to force it to take the same path up as the brake cable. At a later time, the speedometer needs to be calibrated. Since the instructions that came with it cover this step, I won't go into detail on how the unit is programmed. Just as well since instructions such as that usually differ from unit to unit. (1) large grommet, (1) small split grommet for speedometer pass through. needle nose pliers to convince pin to come out of the axle. Jacking up the wheel, taking off cotter pin, castle nut & wheel washers - 15 minutes. Drilling hole through body for sensor cable - 15 minutes. 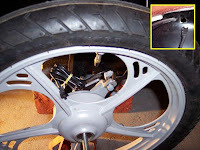 Securing wheel with castle nut & cotter pin, then removing from the jack stand - 15 minutes.